In my personal, albeit limited, experience with pink lemonade, never once did I hear or read just what it is that makes pink lemonade pink in color. 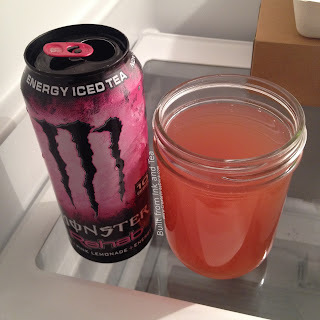 So, when I had the can of Monster Rehab: Tea + Pink Lemonade + Energy in my hand, I wanted to finally research this and then compare with what Monster did in crafting this beverage. From what I learned, pink lemonade usually results from the lemonade being colored by some red fruit (such as raspberries, cranberries, or strawberries)...or red food coloring. My research suggested that the additions were more for the color than for any modification of flavor, but there seemed to be no general consensus on making pink lemonade. From the side of the Monster can, it can be hard to tell just what their story is. The list of ingredients does clearly state that purple sweet potato extract is used for coloring (which sounds better than using red food dye!). However, Monster also keeps things hidden with an ingredient listed as "Natural Flavor," so it is possible that we are getting additional fruit in the mix, too. I have to assume this is the case and that this Monster Rehab is not just a recolored version of the Monster Rehab: Tea + Lemonade + Energy that I reviewed last week! As I smell the beverage from the open cup, I continue to wonder, if it is flavored with some sort of berry. There is a tartness present, which could be cranberry...or it could just be the citrus aspect of the lemonade. The color definitely makes this more attractive-looking than the Monster Rehab: Tea + Lemonade + Energy. But how does it taste? Whatever the additions might be, Monster Rehab: Tea + Pink Lemonade + Energy definitely brings something different than its non-pink counterpart. The flavor definitely tastes more tart to me. The tartness is juicy, and it sits on the back of the mouth and tongue, reminding you of the flavor even after the swallow. The whole of the drink has a disappointing "thinness" or "wateriness" to the taste, which led me to notice something else: It seems to me that the tea flavors are much more subdued in this Monster Rehab than in the non-pink lemonade version. Of course, the difference in the amount of tea flavor between Monster Rehab: Tea + Pink Lemonade + Energy and Monster Rehab: Tea + Lemonade + Energy could be good, depending on your preference. If you like pink lemonade and prefer less tea, give Monster Rehab: Tea + Pink Lemonade + Energy a try. The lesser amount of tea really is a small difference and fairly relative, given the other flavors that comprise the drink. Otherwise, if an Arnold Palmer is more your tea and lemonade drink of preference, I recommend Monster Rehab: Tea + Lemonade + Energy for a new blend of energy. Monster Rehab: Tea + Pink Lemonade + Energy is often available at supermarkets and convenience stores in the United States. Here we have another entry in the Unconventional Tea Reviews category. This time, Monster has crafted another of their Monster Rehab blends, intended to give you energy and hydration at the same time. I have to admit, the color this pours is probably the least attractive thing about it, but given that most folks probably drink it from the can, what is that experience like? To start, the description of Monster Rehab: Tea + Lemonade + Energy sounds like Monster took inspiration from the classic Arnold Palmer recipe (iced tea and lemonade). I am personally not very familiar with the Arnold Palmer drink, but I did find it interesting that it is usually comprised of three parts unsweetened tea to one part lemonade, and there is a variant wherein the ratio is one part tea to one part lemonade (called a Half & Half). While it is not clear just what ratio Monster used, the drink smells pretty even, the lemonade aroma blending with a light black tea scent. 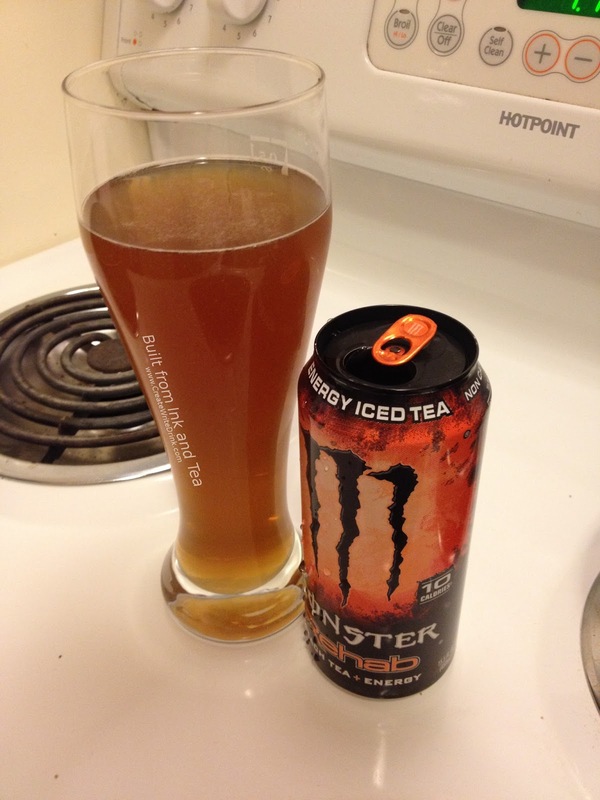 Of course, also included is Monster's energy blend, which does lend its own juiciness to the aroma. The flavors combine a really smooth lemonade with a noticeable amount of black tea. As I usually feel with these drinks, it could use a bit more tea flavor in my opinion. That said, I also appreciated that the lemonade did not seem overly sweet. The tartness was subdued and not strong enough to pucker the mouth. Overall, I found Monster Rehab: Tea + Lemonade + Energy to be an enjoyable drink, an energized and refresh homage to summertime lemonade and an intense variant to blended tea beverages. Monster Rehab: Tea + Lemonade + Energy is often available at supermarkets and convenience stores in the United States. The weather has grown colder, where I live. The long nights of winter are approaching, and warming herbal blends make for perfect evening drinks. Whispering Pines Tea offers Elder Grove to suit just that cup and provide a relaxing, non-caffeinated experience. Blending spices, herbs, and elderberries, Elder Grove promises an enticing blend of flavors. The aroma of Elder Grove covers a range of scents and impresses upon me heavy, warm tones. Foremost, I can smell the juiciness of the elderberries, sweet in their addition. Cinnamon is noticeable, a sweet and spicy topping. The chicory can also be smelled, if one is familiar with the aroma and looks for it. 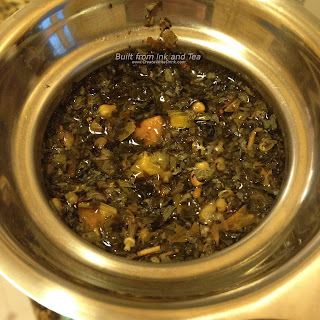 Extra spicy in this blend is the holy basil, and I know from experience that the flavors imparted by that herb might be both warming and intense. 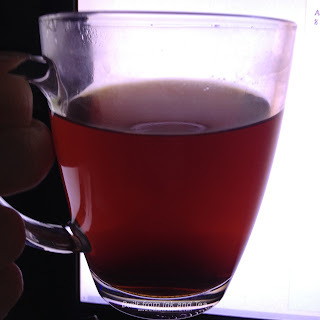 After the five minute steep has been completed per the directions on their website (1/2 tablespoon in 8 ounces of just-boiled water), I hold in my hands a very dark cup of aromatic bliss. The core of the aroma resides in a sweet and spicy blend of scents. 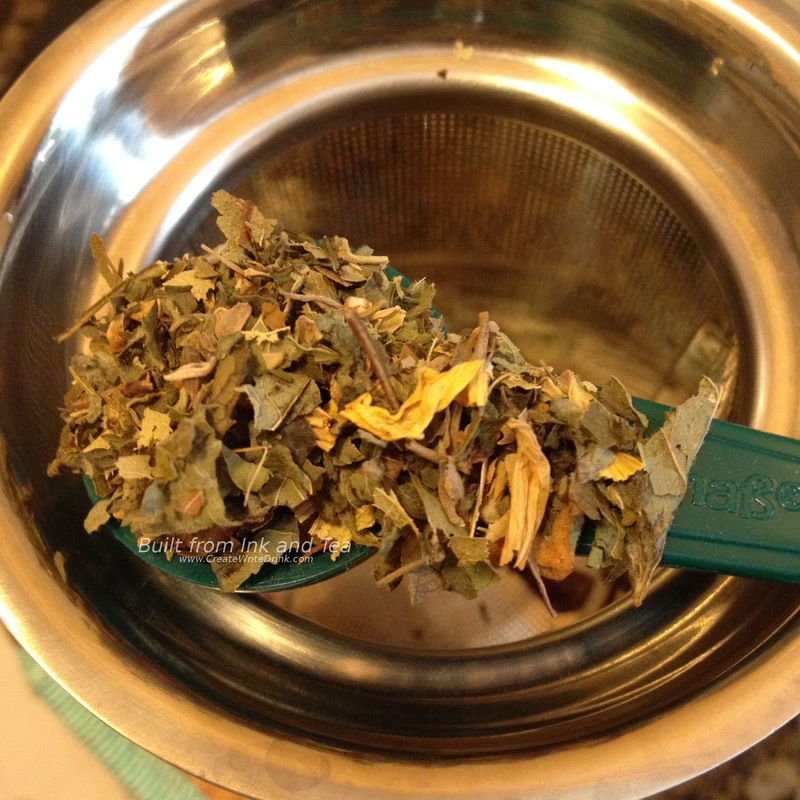 Steeping has brought the different herbal and spice notes together, melding them into a very cohesive smell. However, the initial sip actually surprises me! The first flavor to hit my tongue is the lemon balm, laying a smooth foundation for the others. What follows embodies a slightly-sweet, but not at all sugary, berry-edged mixture of earthiness and spice. However, even the spice is not heavily spicy. With the inclusion of holy basil, I was anticipating almost a stinging-spice (in a pleasant way, really), but instead this tastes very mellow. Elder Grove goes down so smoothly; the flavor is soothing. 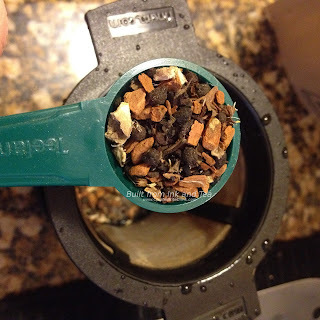 While the aroma seemed warming, I did not find the flavor to be overly so, which was fine; this blend tasted delicious. As I savor the end of the cup, I realize that a slight warm feeling has spread throughout my body. That contributes to the soothing feeling. On my personal enjoyment scale, I would rate this herbal blend a 5. On cold winter nights, I will definitely enjoy cups of this. Peaceful moments with a cuppa are not far, when Elder Grove is had. Whispering Pines Tea's Elder Grove herbal blend is available from their website, here. Back in 2013, I reviewed to Monster energy drinks as a part of my series of Unconventional Tea Reviews. First was the Monster Rehab: Rojo Tea + Energy, an energy drink that of all things combined rooibos with a bit of black tea, their energy blend, and...cranberry, which dominated the flavors. (You can read my review, here.) Then, I tried Monster Rehab: Tea + Orangeade + Energy, which was surprisingly smooth and lacked the intense tang or sour flavors of a lot of orange beverages. (You can read my review, here.) 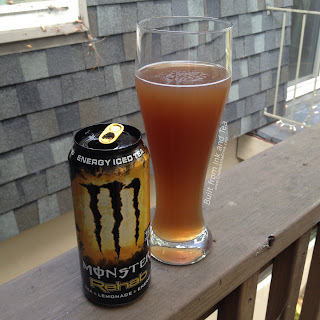 Today, I have for you the next Unconventional Tea Review - a review of Monster Rehab: Peach Tea + Energy. What has Monster added to their energy blend this time? Black tea and peach juice concentrate! Given that the can says this contains 3% juice, I wonder just how much tea it contains. Pouring it into a glass, I can certainly smell the peach. The aroma reminds me of the liquid in which canned peaches are packed. There is a scent present, too, that I think might be black tea, but I am not sure. It smells vaguely like the sharpness of tea (probably a Ceylon blend). Flavor-wise, I should note that this is not a carbonated beverage. While I have tried sparkling tea drinks before, I find that the tea flavors must be very strong in order to compete with the carbonation. Thus, Monster made a good choice in not carbonating this Rehab. The peach flavors are strong, but thankfully are not as sweet as a syrup. They do actually taste smooth and juicy. I can taste the tea, albeit not very prominently. This drink somewhat reminds me of a peach sweet tea from the south eastern United States. Monster Rehab: Peach Tea + Energy goes down very smooth and crisp. The lingering aftertaste is of peaches and does not feel cloying with sweetness. I never felt as though any of the flavors in the drink were too intense or overbearing. I did find it interesting that this beverage contains coconut water, but I think the intention there was to assist in the re-hydrating for which they promote this drink. If you like peaches and energy drinks, give this a try! Monster Rehab: Peach Tea + Energy is often available at supermarkets and convenience stores in the United States. This week's tea review showcases another of the amazing teas from Whispering Pines Tea Company. Their offerings never cease to bring wonder to my tea-drinking session. 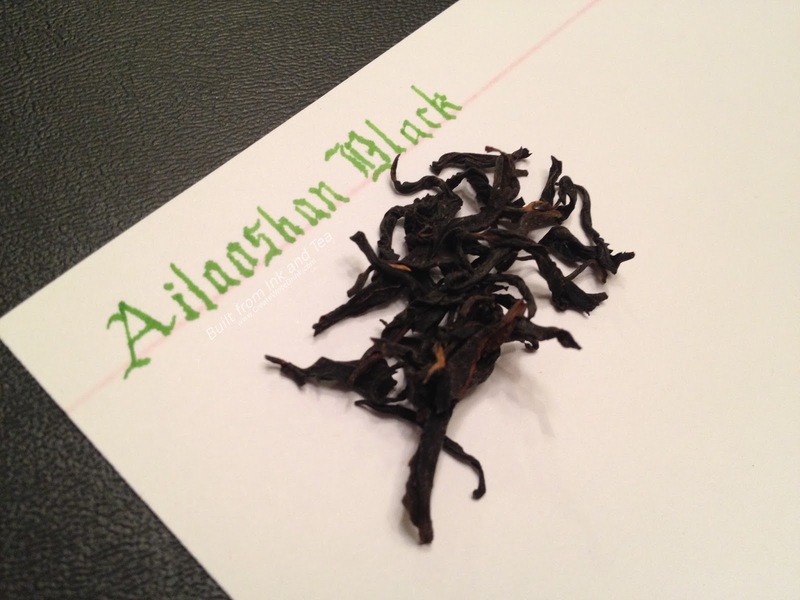 The Ailaoshan Black that I will be drinking was harvested in the spring of 2016. As this tea is harvested twice per year, the vintages are likely to each have their own nuances of flavor that will delight tea connoisseurs. I began by boiling water. 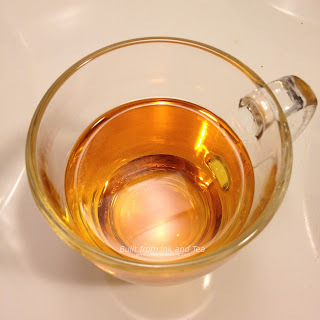 Then, as suggested by the Whispering Pines website for western style brewing, I steeped a teaspoon and a half of tea in eight ounces of water for three minutes. As the leaves re-hydrated, the aromas of dark fruit rose from the cup. I breathed deeply and reveled in the awesomeness of tea. Let me be clear, this tea is not (artificially) flavored in any way, all the aromas are coming naturally from the leaves themselves. I noted a sweetness to the dark fruit, which is not quite plum but softer than black currant. The sweetness reminded me of caramelized fruit, akin to a cooking fruit compote, and the warmth of the sweetness made it seem rather natural. This release of smells was incredible, when contrasted with the more vegetal fruit aspect that the dry leaves maintained. My first taste brings cocoa and earthy notes to my tongue. 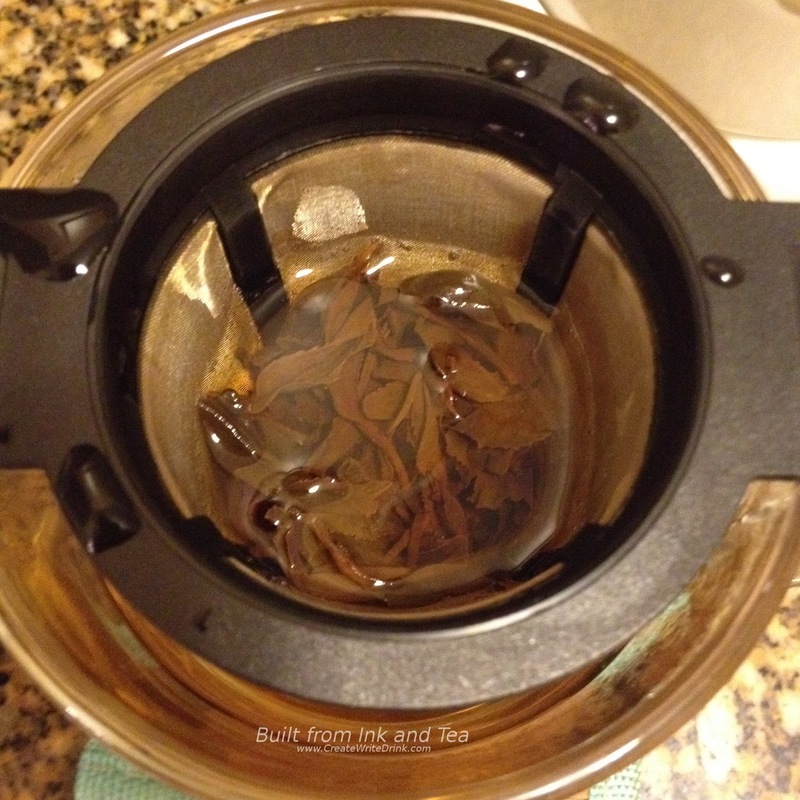 Those notes are not wood exactly, but more like soil, though without the mushroom-like qualities one finds in pu'erh. The tea does taste, in a sense, woodsy. Less intense than they were in the aroma, the dark fruit notes reveal themselves in the flavors, ringing the whole of the taste and lingering long after the swallow. They have in them an inherent warmth that leaves a soft, glowing feeling of flavor on my tongue, even after the sip is done. I am impressed by the sheer presence that this tea has. Even after the cup is finished, the tea stays with me on the tongue, its very slight astringent hint adding another aspect of complexity. When I breath out through my nose and mouth at the same time, those lingering notes of flavor are experienced in a shadow of taste and smell. 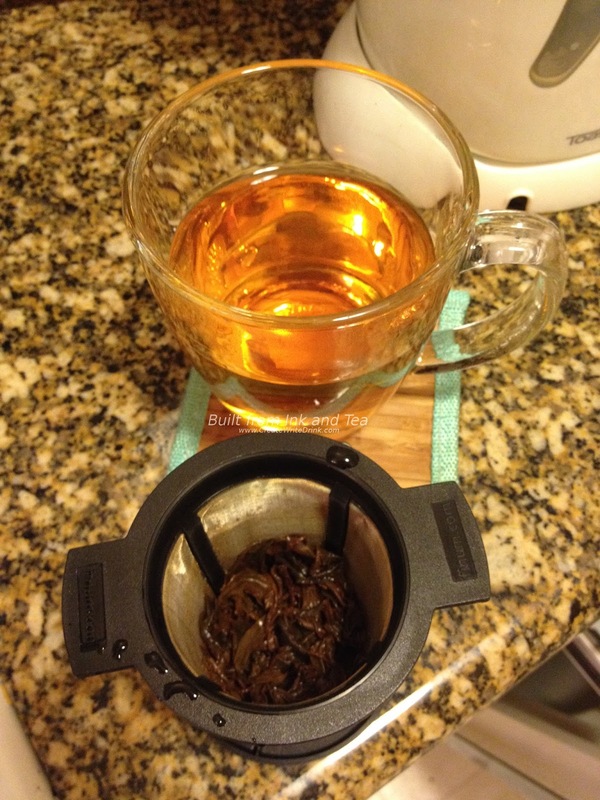 Whispering Pines recommends infusing this tea a second time, so I follow their directions. 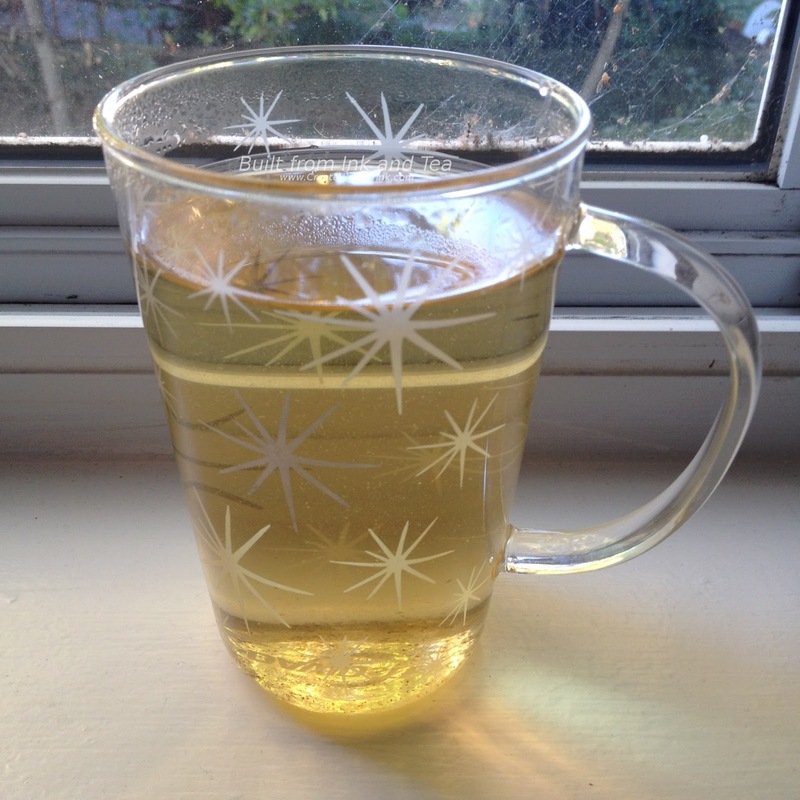 After a five minute steep with the same leaves in just-boiled water, I have a cup that looks just as strong as the first one. The aromas are also similar, though I feel that the earth tones have strengthened with this second cup. The flavors seem rounder to me, softer with a sense of core dark fruit intensity that fades to smooth, cocoa note edges. I highly recommend visiting Whispering Pines' website and reading the wealth of information about the Ailaoshan Black tea. I found it fascinating. Truly, drinking this tea was an experience. On my personal enjoyment scale, I would rate this tea a 5. Whispering Pines Tea's Ailaoshan Black tea is available from their website, here. Ready to chill? The Big Chill by DavidsTea has the herbs that are intended to help you relax and sleep better! If you have had Mother's Little Helper by DavidsTea, this is a lot like that...but with a citrus twist. It is time to relax...and try this blend! From the aroma, I instantly notice two things: mint and lemon-like scents. However, there is a lot more than just those two smells coming from this blend. The mixture smells sweet in an herbal way, and it smells like there are a lot of different aromas blending together. I steeped two teaspoons of the herbal blend in twelve ounces of just-boiled water for seven minutes, then let it cool enough to be drinkable. The aroma of the brewed tisane carries all the same scents as the dry mixture, albeit with a heavier emphasis on the lemon-like smell. The first sip tastes delicious. 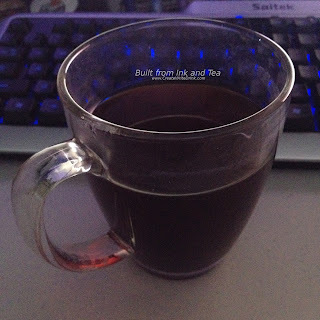 Despite the long steeping, it does not at all taste strong. If anything, the flavor is a bit weaker than I would have preferred. The body of the tisane does not taste sweet, but there is a certain sweetness to the aftertaste that I suspect comes from the apple and the mint. As I sip down the cup, which goes smoothly, there is something about it that spreads and warms the body. 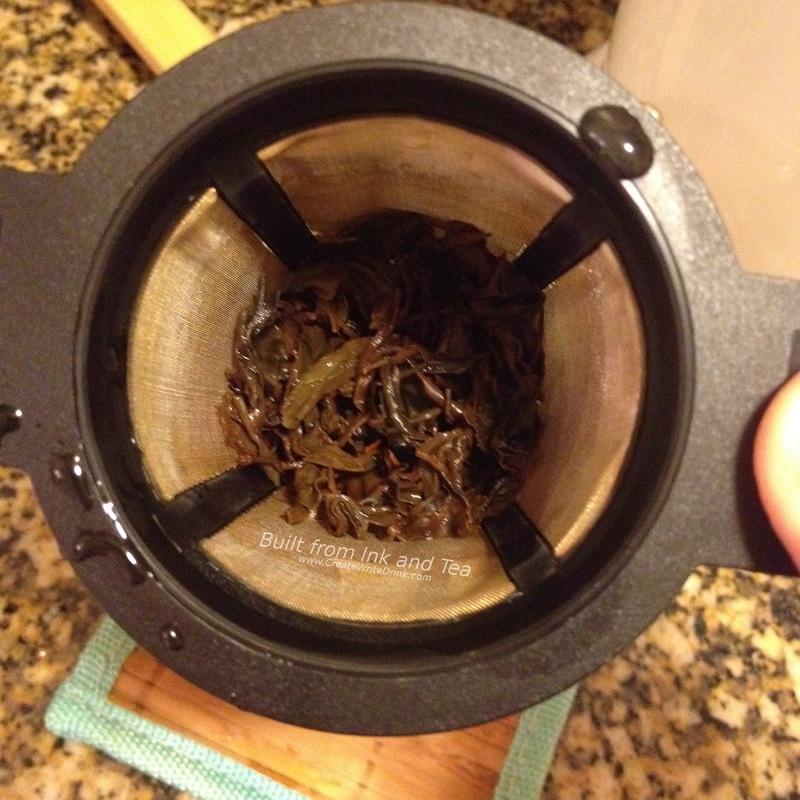 When I finished my first cup, I made a second, using a long steep time and twice as much leaf (four teaspoons). The two flavors that got really intense? The mint and the lemon. This is the intensity that I was anticipating, and I find it to be fairly tasty. On my personal enjoyment scale, I would rate The Big Chill a 3. DavidsTea's The Big Chill can be purchase from their website, here.